Theatre 8:15 in Green Oh, October 28 - 29, 2017. Writers, directors, actors and techies will be needed to create the original short plays that will be written, rehearsed and presented in 24 hours...ready or not! Registration is open now and early birds will save! 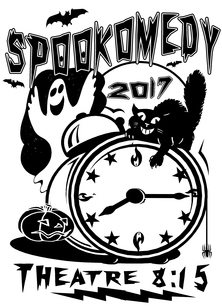 Click on the OnLine Box Office and choose Spookomedy Participant Registration link to reserve your spot NOW! So you want to be on a writing team but can't travel to NE Ohio? No worries, Satellite writing via Skype etc. will again be available. More details on all positions will be coming in the days to come but plan now to have to most exciting day you've ever spent in a theatre! Like and follow "SPOOKOMEDY" at Theatre 8:15 and Friends on Facebook to get the latest news on updates! 24 HOUR THEATRE (aka Play in a Day) is coming to Theatre 8:15, 4740 Massillon Road in Green OH 44232, October 28-29, 2017. In just a 24 hour period of time, several short original scripts are written, actors memorize and rehearse lines, director's brains work overtime all while costumers and prop masters are building and searching for the wish lists handed to them just hours before the curtain rises and the show starts, ready or not! Here are some FAQ about how, what seems impossible, a PLAY IN A DAY, works. HOW DO I KNOW WHAT ROLE IN THE PRODUCTION I WOULD BE BEST SUITED FOR? 1. Writer - No previous experience required, only the desire to let your imaginations run wild and put it on paper in play form. Writing teams of 3 are strongly suggested. A team must contain at least 2 members. If a writing team of 2 wishes to work together that must be noted at time of registration. A third member may be added to a team of 2 if determined to be necessary by the producer. If no partners are requested, teams will be compiled by the producer based on ability, interests and experience. At least 1 member of the team should have moderate typing skills and access to at least one laptop. Note: previously, the use of features like Google Docs on multiple computers has proven beneficial. 2. Director - Experience helpful but again not necessary. This is actually a good platform for a first time or newer director that will have a small cast and relatively simple staging needed for a short play. The director will read the script for the first time along with the cast at the Sunday 7 AM breakfast. The director interprets the original script and characters, blocks and assists in bringing the writers and their own vision to the stage. 3. Actor - Experienced or not, all are welcome to the 24 Hour Theatre stage. A one minute timed audition is to be performed prior to the selection process. The audition can be anything that shows the performers talent and personality, a funny story, a dramatic scene or a special talent demonstration. The best auditions are the well prepared. With less than 12 hours to memorize a role, memorization can be a challenge but not impossible. At the time of registration, potential actors will be asked to rate their memorizing skill level on a 1-5 scale, writers will consider these ratings when assigning roles of various sizes to individual performers. Stage manager, will coordinate the transitions between plays and the individual needs of each play. Costumer, will locate the desired items or offer suggestions to build/create options to fit the needs requested by writers and directors. Props and furnishings, will search the location for the desired items and/or build/create any specialty items. Writers- 7 PM Saturday for selection of keywords, mystery props, audition process and selection of directors and casts. Writers will be required to write and complete their scripts between 10 PM Saturday and 6 AM Sunday. Yes, those are the hours, night owls rejoice, others may be subject to large amounts of coffee or Mountain Dew! Upon completion of script, writers are excused and of course are welcome back to see the world premiere of their work Sunday at 7:15pm. Directors time commitment- 7 PM Saturday for the selection of keywords, mystery props and the selection of the casts. By approximately 10 PM Saturday, directors are excused and return at 7 AM Sunday for the first read-through and immediately begin rehearsals which will continue throughout the day until the final dress rehearsals and the performances at 7:15pm. Actors- 7 PM Saturday for selection of Keywords, mystery props and audition process. By approximately 10 PM Saturday, actors are excused and return at 7 AM for the first read-through and immediately begin rehearsals which will continue throughout the day until the final dress rehearsals and the performances at 7:15pm. All Writers, directors and actors participate in the one minute "anything goes" audition. Auditions are timed and a buzzer will end the audition. The wider the variety of auditions, the better. Funny stories, dramatic readings, unique songs or demonstrations of any special talents or skills are ideal. The best auditions are the ones that have been well prepared. While only the actors auditions will assist in their placement into individual plays, the process itself can be very entertaining and the personalities of writers and directors are showcased in this process. WHAT IS THE PROCESS FOR WHO IS CAST IN WHAT SHOW AND WHO WILL DIRECT FOR WHICH WRITING TEAM? Plain and simple..it's complicated! Let's leave all the details for that night, just know, that it will all be totally random and the outcome will be anything but predictable. Through a series of numbers being drawn, "stealing", trading and the choosing of mystery props and costumes, nothing can or will be planned. WHAT IF I REALLY REALLY WANT TO DO THIS EVENT BUT I HAVE A MINOR TIME CONFLICT THOSE DAYS? While part of the fun is the time element involved, everyone does have a life outside of theatre, LOL. You will not be locked into the theatre or the set time frames as long as you and your team understand your short time away from the theatre and the rehearsal process is not a burden on your fellow cast mates. THIS SOUNDS LIKE IT WOULD BE AS MUCH FUN TO WATCH AS BE IN! It is! That is why it is very important to be sure to let your family and friends that love seeing you ( or have always wanted to see you) on stage know you'll be doing this one time only, once in a lifetime event, where anything can and will happen. It is as important that you have them block off the night on their calendar as it is for you to SAVE THE DATE! OK, I'M SOLD, HOW DO I SIGN UP? The registration fee is just $25 for all participants. This covers the cost of all your food and beverages during your time at the event, the official 24 Hour Theatre T-shirt and what ever is left goes into the hosting theatre account, since this is a fun and fund-raising event. Be sure to like and receive notifications from the Theatre 8:15's Facebook page! To Register - Click on the OnLine Box Office above and choose Spookomedy Participant Registration, complete the required fields on who you are, answer a few simple questions regarding your participation and submit your registration fee - it's that easy! If you have any questions please feel free to contact Theatre 8:15 at info@theatre815.com or call (330) 896-0339. This promises to be a great adventure, hope to see you at the theatre! Get ready for the most unique and exciting 24 hours of theatre ever! PLAY IN A DAY is coming to Theatre 8:15, 4740 Massillon Road in Green OH 44232, April 15 & 16, 2016. In just a 24 hour period of time, several short original scripts are written, actors memorize and rehearse lines, director's brains work overtime all while costumers and prop masters are building and searching for the wish lists handed to them just hours before the curtain rises and the show starts, ready or not! PLAY IN A DAY, works. 2. Director - Experience helpful but again not necessary. This is actually a good platform for a first time or newer director that will have a small cast and relatively simple staging needed for a short play. The director will read the script for the first time along with the cast at the Saturday 7 AM breakfast. The director interprets the original script and characters, blocks and assists in bringing the writers and their own vision to the stage. 3. Actor - Experienced or not, all are welcome to the PIAD stage. A one minute timed audition is to be performed prior to the selection process. The audition can be anything that shows the performers talent and personality, a funny story, a dramatic scene or a special talent demonstration. The best auditions are the well prepared. With less than 12 hours to memorize a role, memorization can be a challenge but not impossible. At the time of registration, potential actors will be asked to rate their memorizing skill level on a 1-5 scale, writers will consider these ratings when assigning roles of various sizes to individual performers. Writers- 7 PM Friday for selection of keywords, mystery props, audition process and selection of directors and casts. Writers will be required to write and complete their scripts between 10 PM Friday and 6 AM Saturday. Yes, those are the hours, night owls rejoice, others may be subject to large amounts of coffee or Mountain Dew! Upon completion of script, writers are excused and of course are welcome back to see the world premiere of their work Saturday at 8:15. Directors time commitment- 7 PM Friday for the selection of keywords, mystery props and the selection of the casts. By approximately 10 PM Friday, directors are excused and return at 7 AM Saturday for the first read-through and immediately begin rehearsals which will continue throughout the day until the final dress rehearsals and the performances at 8:15. Actors- 7 PM Friday for selection of Keywords, mystery props and audition process. By approximately 10 PM Friday, actors are excused and return at 7 AM for the first read-through and immediately begin rehearsals which will continue throughout the day until the final dress rehearsals and the performances at 8:15. Complete details about preregistering will be coming in the following weeks. The registration fee is just $20 for all participants. This covers the cost of all your food and beverages during your time at the event, the official PIAD T-shirt and whatever is left goes into the hosting theatre account, since this is a fun and fund-raising event. Be sure to like and receive notifications from the PLAY IN A DAY Facebook page, and follow CBGSPLAYINADAY on Twitter, Instagram and Periscope. If you have any questions please feel free to contact the Crazy Bald Guy (CBG) himself, Mitchell Antesky at BUMRRR@gmail.com, 419-356-6959, or by text, private messenger or smoke signals.